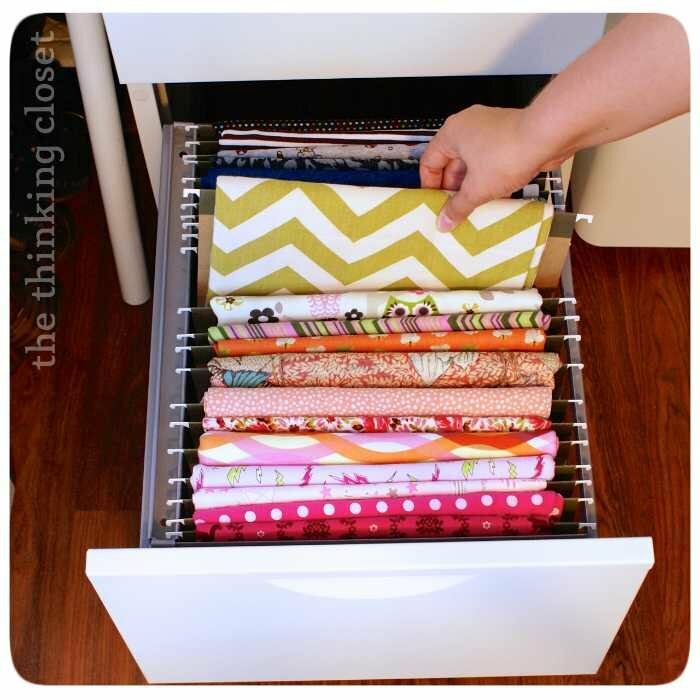 Inside: Seven ways to organize your fabric to simplify your next sewing project. If you do any sewing and feel like a kid in a candy store when browsing for fabrics you can probably relate when I say that having a good system to organize your fabric stash is a must. It’s no secret that I love any excuse to add a new fabric to my home decor. And since I love to mix and match fabrics I’m always on the hunt for my next favorite pattern which often leaves me with a fabric stash that I need to keep organized and declutter often. 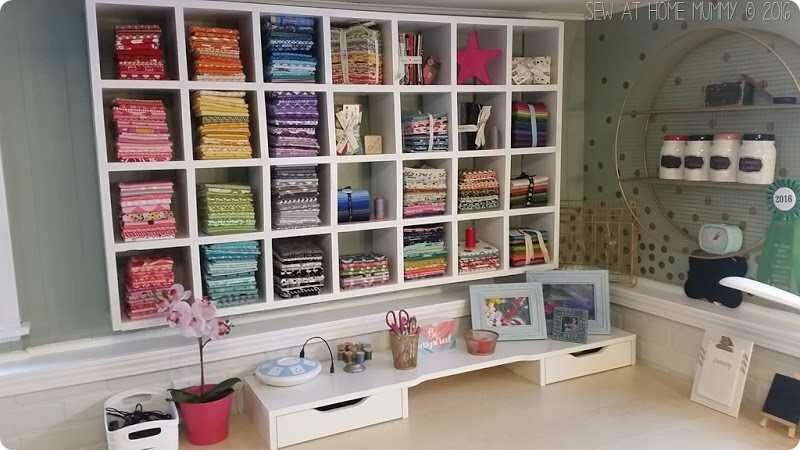 I keep my fabric in a drawer in the built in that I created in my office, but if you don’t have a built in, there are still so many fun and beautiful ways to keep your fabric organized and maybe even display your collection! 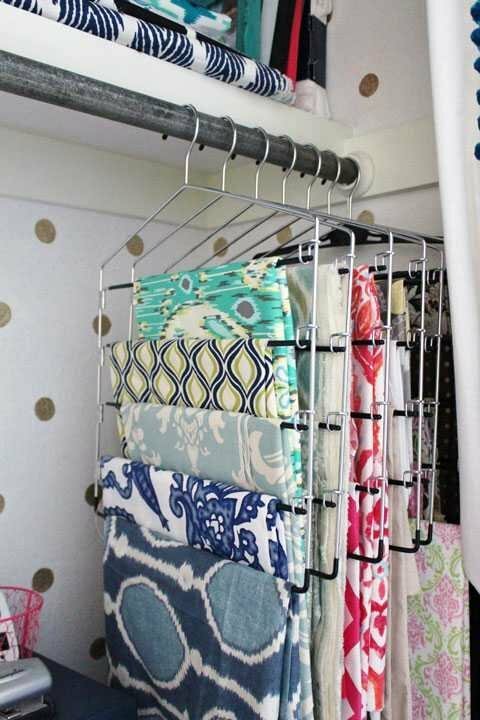 This hanging fabric storage from Ish and Chi is my absolute favorite idea! Not only does it look beautiful, it would be easy to quickly find what you are looking for. 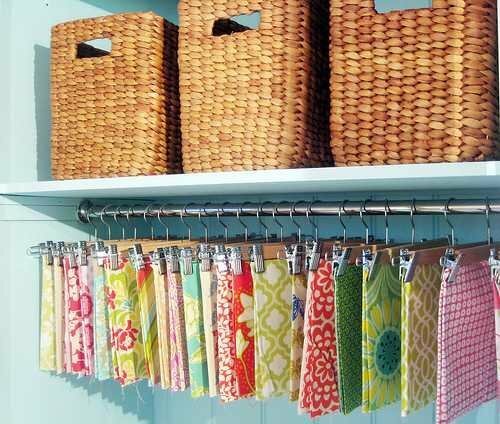 It’s a great way to use an existing closet, just add skirt hangers with clips and your fabric stash! I also love the idea of hanging your fabric so that you can see it because who doesn’t love to look at all those patterns and colors together! 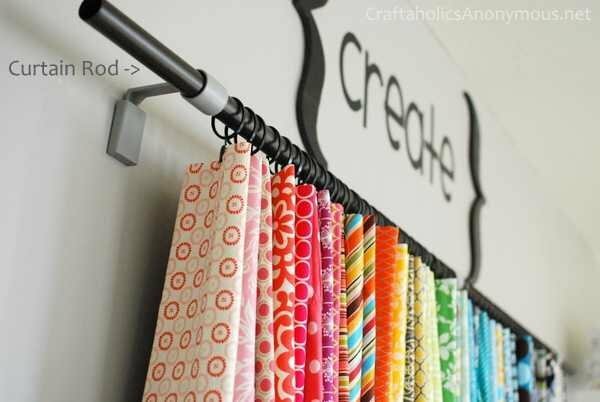 An easy idea from Craftaholics Anonymous uses a simple curtain rod and curtain clips to hang smaller pieces of fabric. You can even use pant hangers to hang multiple pieces of fabric from one hanger like a reader at I Heart Organizing did. A total space saver and perfect for larger pieces of fabric. 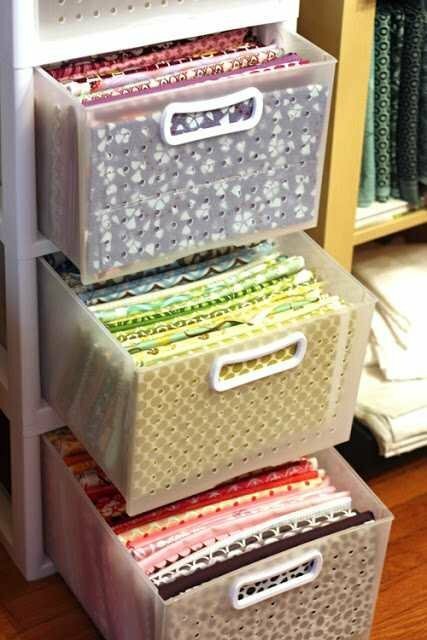 This simple idea for storing and organizing your fabric stash is another of my faves. Almost all of us have a file cabinet and hanging file folders. But simple hanging your fabric over the metal hangers creates instant fabric storage like Lauren at The Thinking Closet did. And again it makes it so easy to see what you have! Folding each piece of fabric neatly and putting it in a drawer so that you can see each piece is another great, and really easy way to organize your fabric, and what I do in my workspace. I use the drawers in the built-in that I created, but you could just as easily use plastic drawers like they did here. 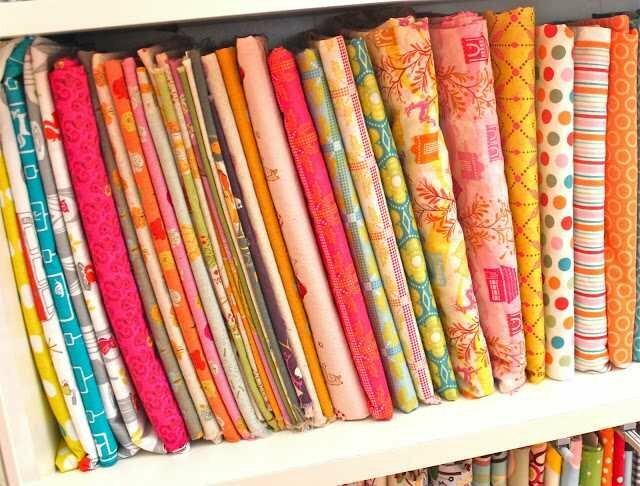 Wrapping each piece of fabric around mini bolts and putting them on a bookshelf like they did at Smashed Peas and Carrots, will make for one colorful display! And using comic storage boards make for the perfect little bolts for fabric! This is the mother of all fabric displays! Sew at Home Mommy built this shelving unit herself to organize her fabric, but you could mimic the look with some already made cube shelves. I just love the idea of having all of that fabric out so it can be seen all the time don’t you? Suddenly, I’m feeling the need to buy some more fabric! Hahaha. I think we can all agree that it would be a dream to sew in any one of these spaces. And I’ll be the first to admit that I have a tendency to let my sewing and craft supplies get out of hand but I recently completely transformed my office/ craft room into an amazing space to work by simply getting rid of a lot of stuff that I didn’t need. Yes I may have shed a tear or two letting go of some fun fabrics but I had to be honest with myself about the amount of fabric and other “stuff” that I really needed and was realistically going to use. It all boils down to creating a home we love and using my decluttering method, I’ve been able to take back entire rooms of my home and turn them into rooms we actually can use and love to spend time in. >>Get more information about my decluttering method here. How do you know which comic card stock to order? Several on the link. I would like at least 100. Is there card stock for larger pieces of fabric like over one yard pieces? Hey Shanna, great questions. The idea of using comic card stock came from Maggie at Smashed Peas and Carrots. She says she buys the 7 1/2 x 10 1/2 inch boards and they fit most fabric perfectly. Read her instructions here and if you have more questions, she can help you! I love all of these ideas! Must try some. 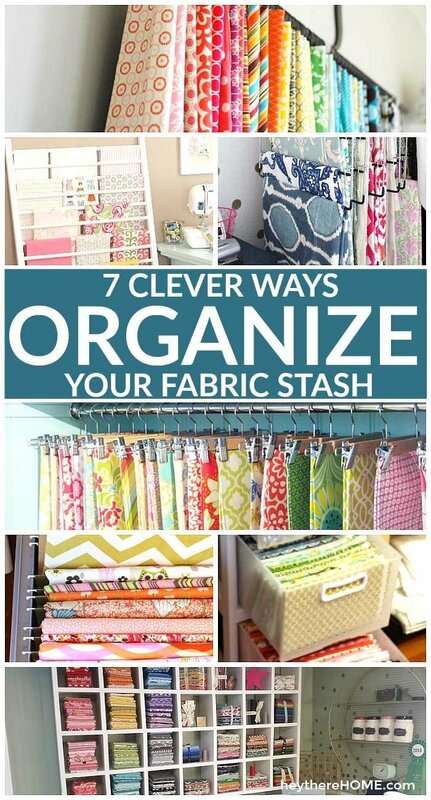 WOW, I love all the fabric storage ideas. 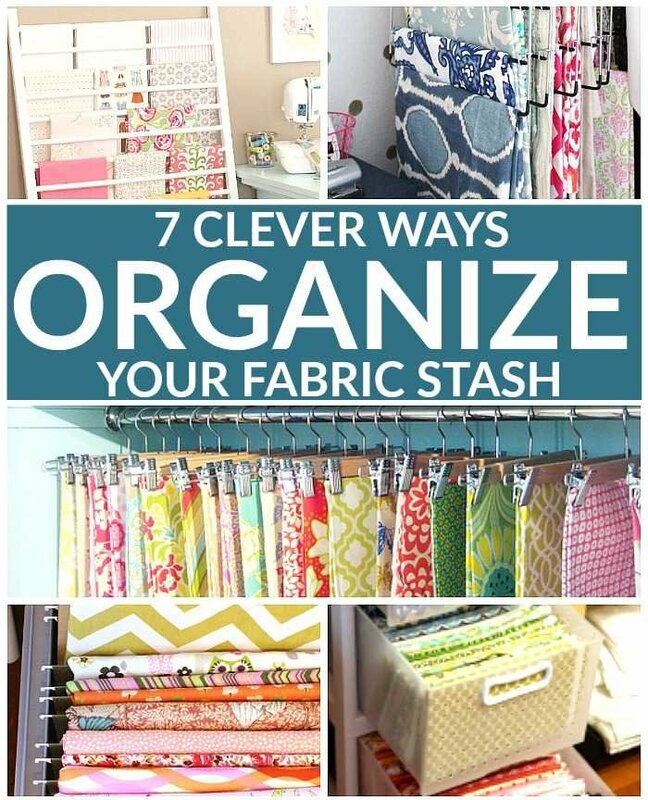 I will certainly add some of these ideas to make my fabrics easier to find. You’re so welcome, Dagmar. Thanks for the positive feedback!